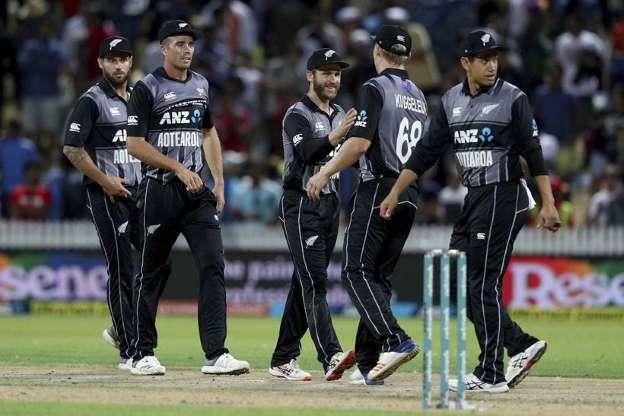 New Zealand denied India a perfect finish to their highly successful tour Down Under by clinching the T20 series 2-1 with a narrow four-run win in the series-deciding third match in Hamilton on Sunday. India savoured a historic Test and ODI bilateral series win in Australia before recording their biggest ODI series win on New Zealand soil. A first ever T20 series win would have been an icing on the cake but the hosts held their nerves to pull off a thrilling victory. With Sunday's result, India have lost their first T20 series after winning nine and drawing one. India needed to knock off a stiff 213-run target to bring curtains on a memorable three-month tour in a befitting manner but fell just short. Krunal Pandya was the most expensive of the Indian bowlers, bleeding 54 runs in his four-over quota. If it was not for left-arm Chinaman Kuldeep Yadav (2/26)'s tight bowling in the middle-overs and Bhuvneshwar Kumar (1/37), India would have got a bigger target to chase. India captain Rohit Sharma, who usually bats explosive in such situations, made an uncharacteristical 32-ball 38 and it also hurt India's chances. Vijay Shankar (43 off 28) played a useful knock though at the top after Shikhar Dhawan (5) fell early. Rishabh Pant (28 off 12) and Hardik Pandya (21 off 11) infused some life into India's chase with some brutal hitting but perished while trying to keep up with a steep scoring rate. Mahendra Singh Dhoni (2 off 4) also could not do much. India needed 16 runs off the final over and Dinesh Karthik (33 not out off 16) after taking a double off the first ball, stunned the crowd and his teammates by refusing to take a single in the third ball. Krunal (26 not out off 30) had reached the striker's end but Karthik did not run, sending his partner back. This was after umpire did not give a clear wide bowled by Tim Southee. Karthik could only manage a single off the next ball as Southee bowled a straight ball. By then, the match had clearly slipped out of India's hands. Both Karthik and Krunal did exceedingly well to take the game into the final over but their unbeaten 63-run stand off 28 balls did not prove to be enough. New Zealand bowlers fared much better than India, consistently hitting the short-of-length, which proved to be key on this small ground. The runs came at a steady rate with just an odd boundary coming in between. Pant though changed the pace of Indian innings with his scintillating batting. It rained sixes as the Delhi left-hander took Sodhi and Santner to cleaners. But debutant Blair Tickner ended his stay and Hardik too began and ended his innings in the same fashion. Earlier, Bhuvneshwar was hit for a six by Munro in his first over but the lean pacer responded with splendid block-hole deliveries in the next over. The pressure of dot balls prompted Seifert to go after Vijay Shankar. He went for a big hit but edged it towards third man region where Shankar made a valiant effort but just fell short as he could just touch the ball. It was a tough chance but Seifert, who was on 11, got a reprieve. The Kiwis though did keep a very healthy run-rate, racing to 50 in just 5.2 overs when Munro heaved one off Krunal for a huge six and followed it up with a boundary on the off side. Krunal leaked 20 runs in that over. Seifert, who paddle swept both pacers and spinners with ease, lofted Hardik for a six over long off. Indian bowlers had conceded 79 runs in first seven overs when Rohit brought Kuldeep and the leg-spinner straight away made an impact, by getting Seifert stumped with Dhoni's lightening quick hands at work. Munro kept going strong as he hammered Krunal for a six to raise the team's 100 in the 11th over. Again it was Kuldeep who came to team's rescue by seeing the back of dangerous-looking Munro while Khaleel Ahmed got rid of Williamson (27). There was no respite for the Indian bowlers as Daryl Mitchell (19) and Ross Taylor (14 off 7) helped New Zealand finish the innings strongly by smashing 61 runs in the last five overs.